This is a Head Hugger knitted from Nancy Lindberg‘s pamphlet NL-12, shown here in a Wool-Ease gray heather. I knitted it many years ago and it’s held up well. 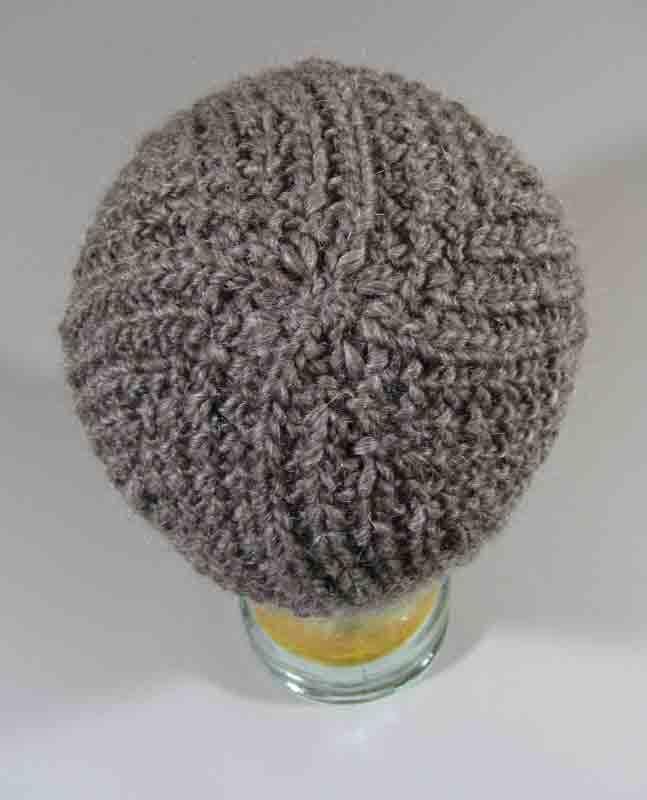 There’s some pilling, a common problem with this 80% acrylic, 20% wool worsted weight yarn. But it’s stood the test of many winters and still keeps my head, neck and shoulders quite cozy. My son dubbed it a knitted babushka, which it sort of is. But I go for warmth rather than style. 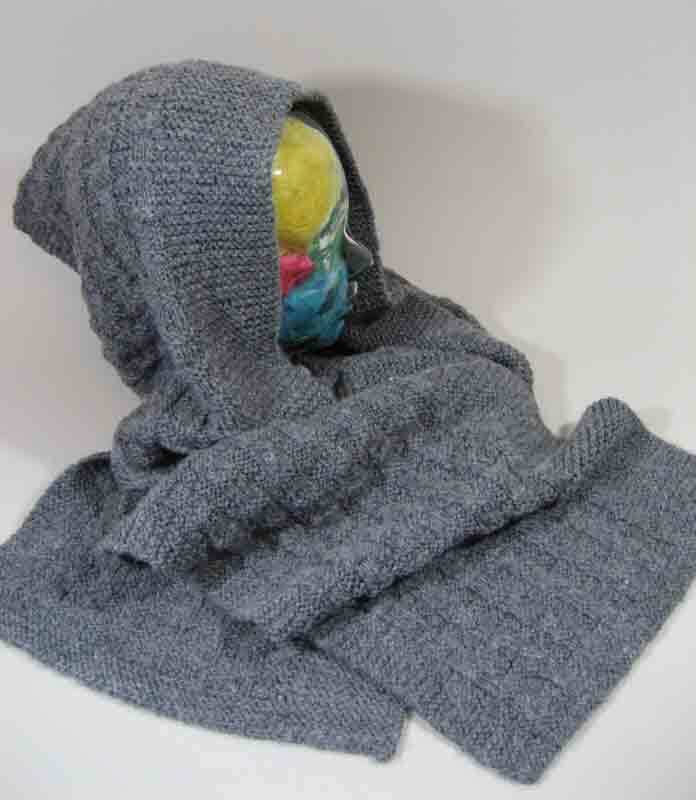 If you’re looking for the pamphlet, google “Nancy Lindberg Head Hugger” and you will find that many shops still carry this pattern, including WEBS. Last weekend’s M.U.S.H. 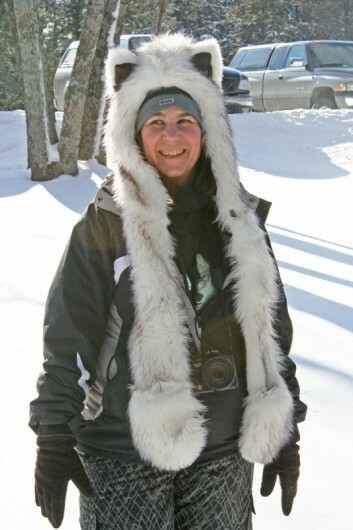 (Mid-Union Sled Haulers) dog sled race at Clear Lake State Park, near Atlanta (Michigan), caught me unawares in the adventurous hat department. 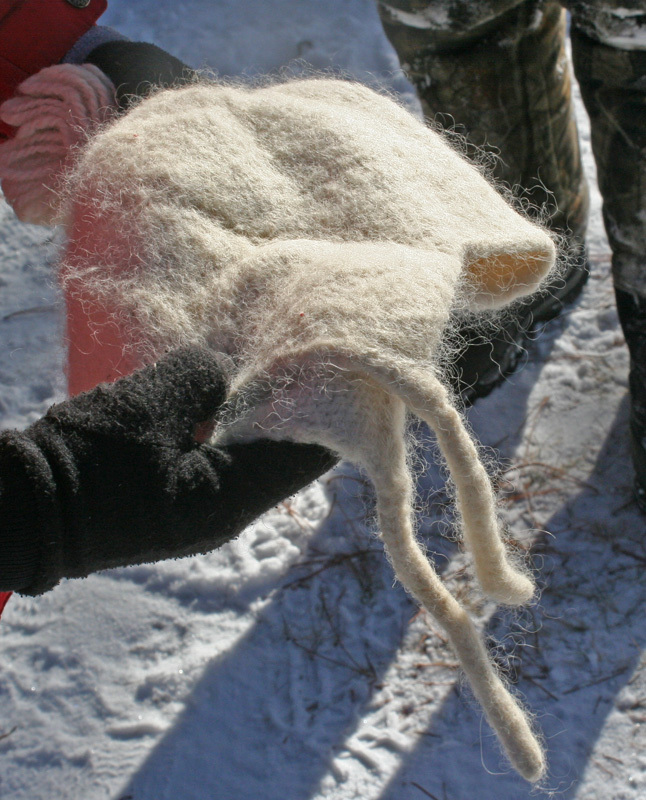 This musher wore a knitted hat with dog fur spun into the yarn. Siberian Huskie, I believe. It works for the athletes doing all the pulling, so why not also for the musher? Samoyeds go through a massive twice-yearly shed (they “blow hair”) and also basically keep up a steady supply of tufts that a dedicated dog hair spinner put to good use in this hat. Its owner told me that there’s nothing warmer. 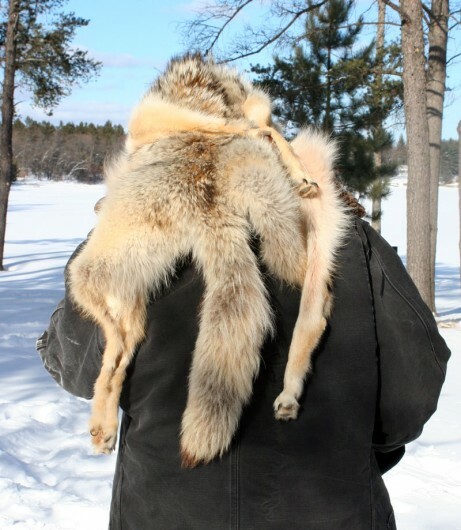 This hat looks like it’s felted and molded itself to its owner’s head. 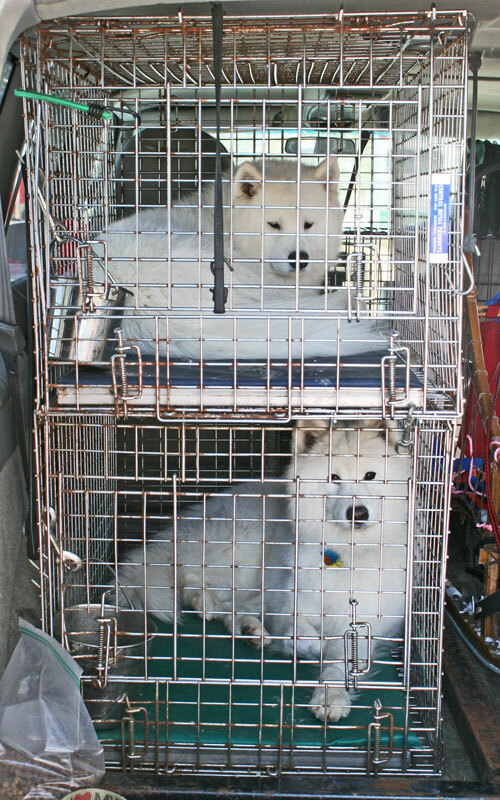 The Samoyed has longer guard hairs but it’s the shorter, softer undercoat that sheds seasonally. I thought the races would be interesting and they were (see my previous post). But I was surprised that the day also provided some knitting inspiration. This weekend we saw our first sled dog race. A Mid-Union Sled Haulers (M.U.S.H.) race. It was a perfect day for spectators. 20 degrees and sunny. About 8 inches of snow on the trails. We watched the 5-dog event and the very exciting 7-dog event. We also watched one and two-dog skijoring. 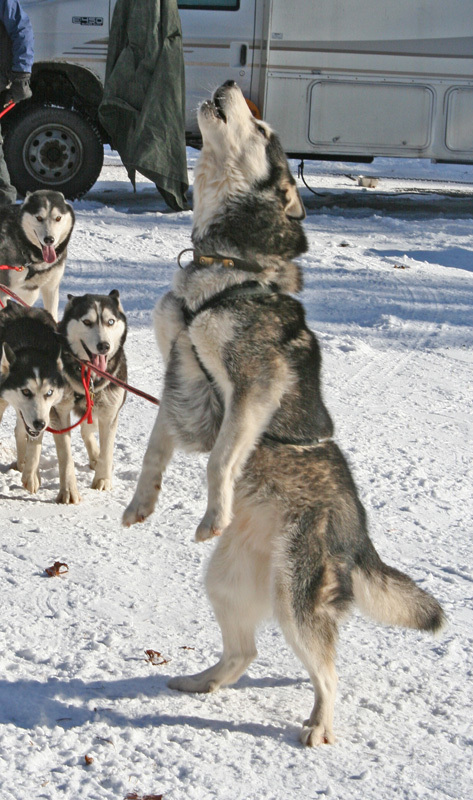 In skijoring, a cross-country skier wears a harness and is connected to dogs by a length of rope. The dogs are also harnessed. The skier skis like crazy and the dogs run like crazy. Before their races, we walked around and met the dogs. All of them seemed to be in game day mode. Some paced a bit. Some barked. Many rested calmly. They were well-fed, well-groomed, and well-hydrated as all fine athletes must be. There were many young people tending to the dogs. Feeding and watering them. Shoveling up LOTS of poop because that’s a M.U.S.H. must. Leave nothing but pawprints behind. M.U.S.H. allows no whips. 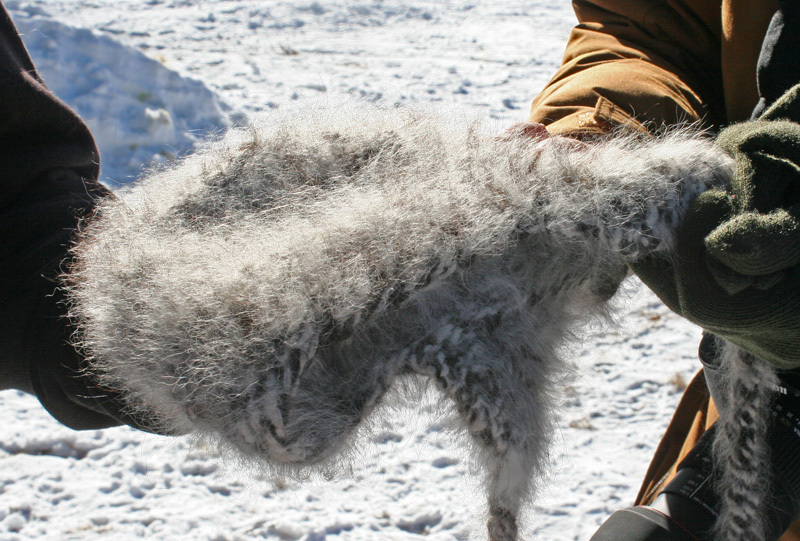 Except in the one-dog event, each musher must carry a dog bag. 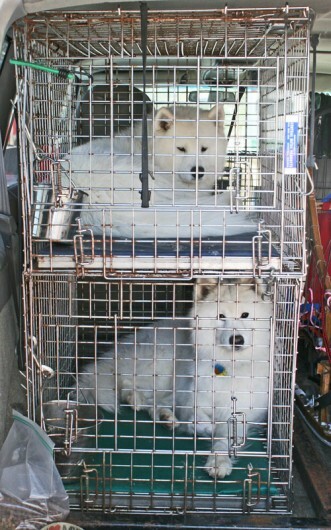 If a dog is hurt, he’ll be picked up by the musher, tucked into the bag (on the sled) and packed out by his buddies. I came away feeling that these folks understand the responsibility that comes with participating in a two-species sport. Hill Country Hat is included in Clara Parkes Knitters’ Book of Wool and Parkes has generously released it as a free pdf on her Knitters Review website. This is my third time knitting the pattern, shown here again in Brown Sheep Lamb’s Pride Bulky. 85% wool, 15% mohair, in a wonderful palette of 98 different colors. This pattern knits up lickety-split, at 4 stitches to the inch. I (basically) got gauge with 10.5 needles. One skein was all I needed, even though I made one extra repeat of the Hills and Valley pattern, knitting 16 rather than 12 rows in the body of the hat before beginning the crown decreases. Cold weather is bound to come to Michigan soon. A day here and a night there just won’t do. 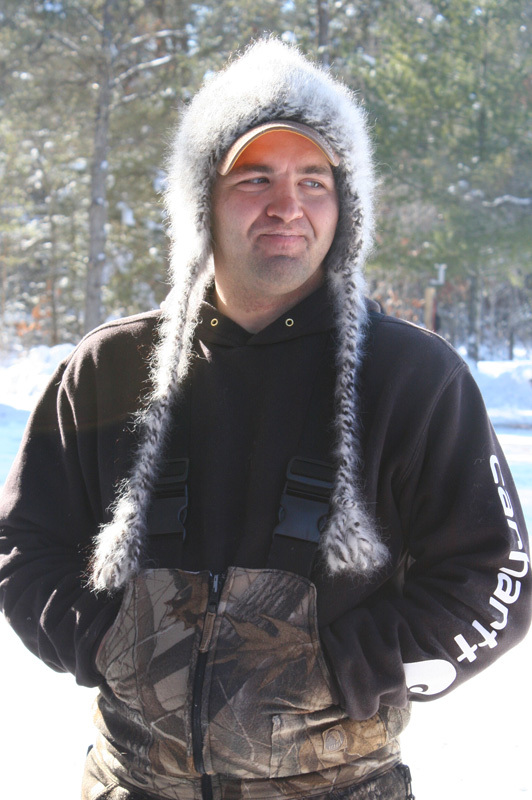 This hat will keep all heads toasty as can be. In fact, I may wear this to the dog sled races at Clear Lake State Park this weekend. The Mid-Union Sled Haulers (M.U.S.H.) will be racing as long as there’s enough snow on the ground and the weather conditions are proper to allow the dogs to work safely. 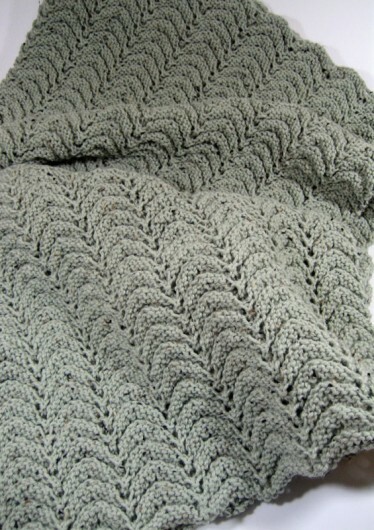 This sweet vintage-looking blanket is a Project Linus Security Blanket. Linus van Pelt is Charles Schultz’s character from the Peanuts comic strip who took comfort from his blanket and was rarely drawn without it. “Blanketeers” from all over the country knit for Project Linus and send knitted and crocheted blankets to be distributed to where they can do the most good: children. This modified feather and fan blanket is worked up in a simple, completely reversible, three-row pattern. 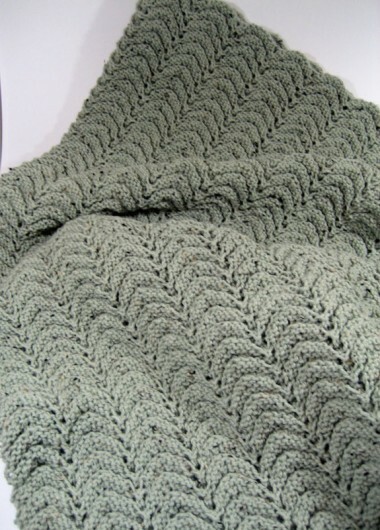 My large-sized one, on 210 stitches, turned out to be 44 inches wide by 42 inches long. The pattern is “reproduced with permission” from Project Linus in Betty Christiansen’s Knitting for Peace. 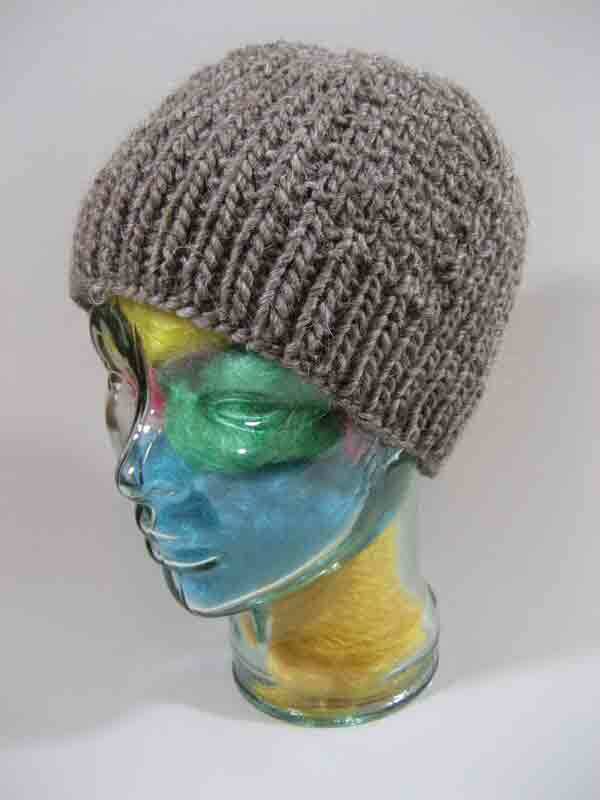 It is a real yarn eater, knitted of 1600 yards (8 skeins) of Plymouth Encore Tweed in #2334. No name for the colorway, which is kind of refreshing, just #2334.This colorway is actually rather shy. I’ve photographed it several times and can’t quite capture it’s true color. It’s a bit less green.